A few months back I posted form info on the infamous Crater Critter. 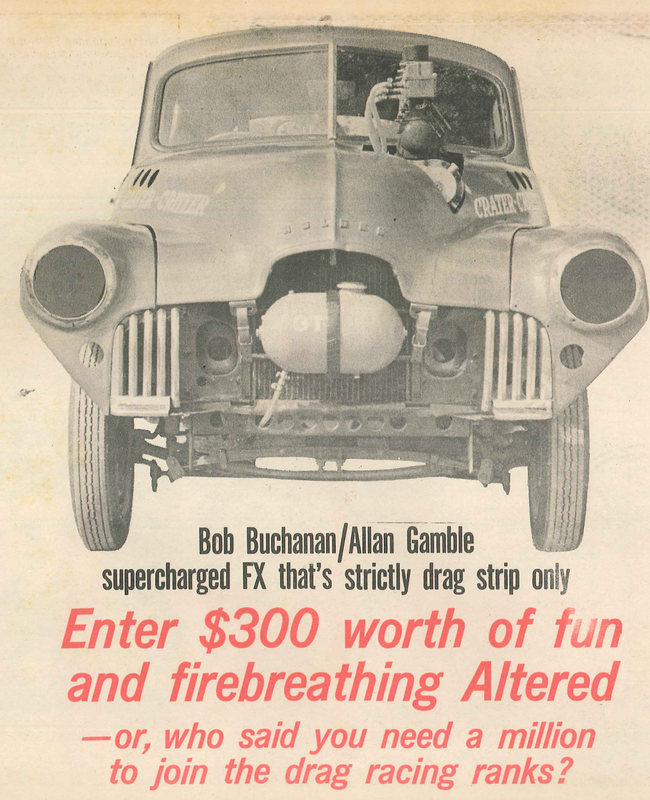 Here: http://www.thegreymotor.com/2014/08/1210-second-grey-motor-crater-critter.html I have recently come into possession of "Australian Rod Sports magazine, January 1969" with this further article. THERE'S a ferocious, fire-breathing "Crater Critter" loose in the dairy paddocks around Echuca — not that the farmers or the cows are very upset about it. Matter of fact, any Victorian drag racing enthusiast will tell you that Echuca is a real hotbed for firebreathers — the cows, the farmers and the critters all get along very happily up there. .. . The critter under discussion here is an iridescent mauve number owned by dairy farmers Bob Buchanan and Allan Gamble. Neither are newcomers to the drag racing ranks and their latest charger, "Crater Critter", looks like being their most successful runner yet. The Critter has taken Bob and Allan about 19 months to nail together and has set them back about $300 to date. The name . . . ? Yes, you're right, Mr. Nabisco did think of it first . . . but you'll never see anything like this come boring through the top of a Weeties pack, mate! The name suits the car well. Built to conform with Altered regulations, the Critter campaigns in C/A class and missed out on the class win by point two of a second on its first outing at Calder Race-way. With the timeslip reading 14 sec. dead for the distance, greater familiarity with the new machine should soon see times tumbling down. The Critter tips the scales at 16 cwt. Helping to cut the weight down is the Anglia front end, which replaced the FX unit and also stretched the wheelbase to 106in. A stock rear end is used, but runs an FJ diff. Reverse traction bars are used to tie the rear down, while the _Anglia.front wishbone (has, been , split and the twofront 'arms-mow locate to the rear engine' mounts on either side. Tele shockers ex•Fiat 500 have been fitted to all corners and the boys say this particular setup works well on the strip. Wheels up front are reversed VW units running 400 x 15 tyres. At '- the rear, wide hoops with Dunlop White Spot 700 x 13s make the crucial touchdown. Smaller tyres will be fitted soon as the big Dunlop bags are just a little too big for the power output at the moment. Mill used to get the Critter mobile is a stock bore FB block running FE head. Paul England was responsible for balancing the reciprocating parts, a Wade cam is the only non-stock item used internally. A spare head is at present being worked over to be bolted on in the near future, but the boys are quite satisfied with the stock item at the moment. What gives the mill its oomph! can be found mounted atop the works — a whopping Marshall blower running three Stromberg (ex-Holden carbs). Even with the bonnet closed the puffer is a dead giveaway with the carbs rising well above the bonnet and the banshee wail of the unit piercing away inside the engine compartment. 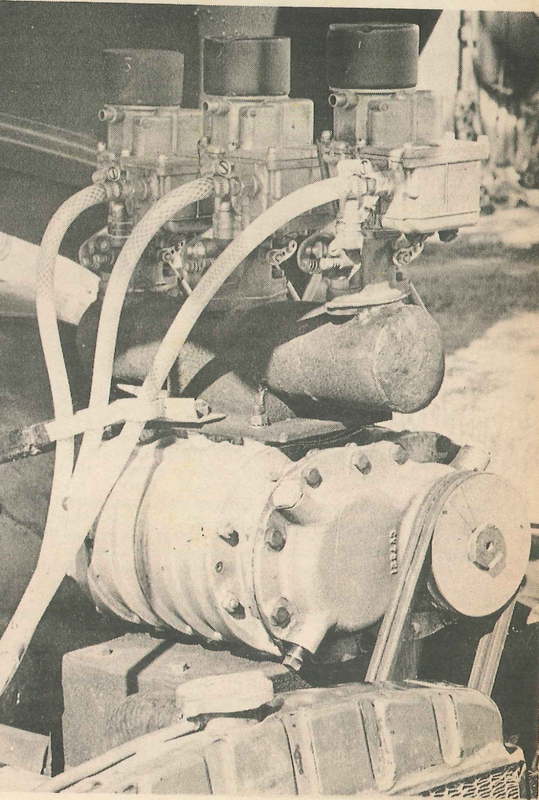 With a 20 percent overdrive ratio, the puffer will pump approximately 7 lb. boost, depending on belt slippage. Two V belts are used to drive the blower, the pulleys and idler were made up by Bate Engineering in Echuca. Fuel used is 115 octane and up to half-a-gallon of the firewater is used on each run. A stock 149 Holden fuel pump has proved itself quite capable of meeting the demand. WILDLY modded FX "Crater Critter" runs sharp mauve lacquer work and neat signwork — looks the part! 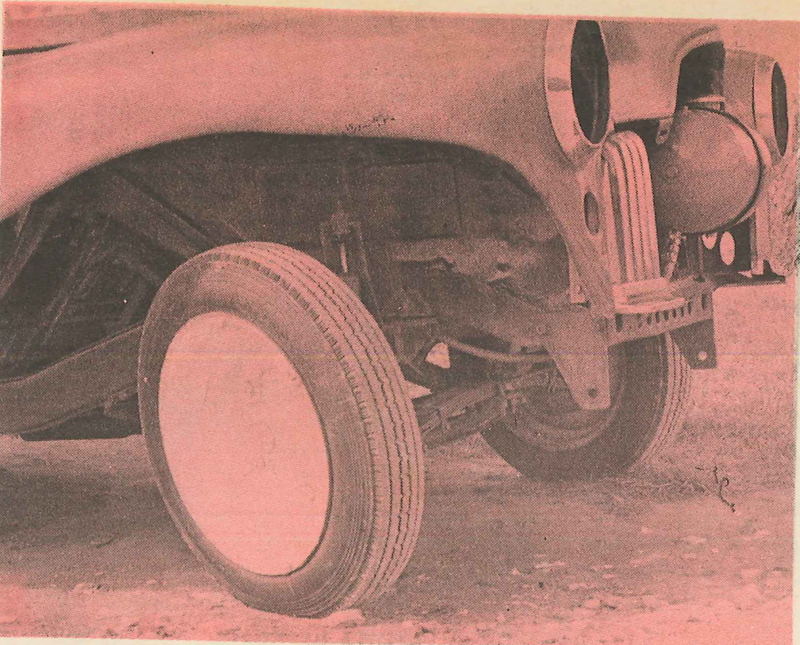 Chopped front fenders show Ford 10 front axle used. Mill used is a stock bore FB unit fitted with FE head. Fuel tank nestles in centre of grille and supplies 115 octane juice via 149 fuel pump to triple Strombergs atop Marshall K200 blower which runs 20 percent overdrive and 7 lb. boost. Manifolding was home-made and includes Sin. tube mounting carbs to blower, plumbing is finished in matt black paint and offers stark background when occasional icing up occurs. A homemade Hint extractor system dumps the noise out the side with the familiar "blown" roar to deafen the bystanders. Big mod on the ignition side is the Scintilla magneto which supplies the fat sparks to Bosch plugs. The mill is cooled by a stock radiator. Both the radiator and the engine are located in their stock positions. Transmitting the power aft are a stock FX gearbox and tailshaft. Clutch is a 186 unit and shifting the cogs is accomplished with a Rev-H floor shifter. The interior, as expected, is sparse — picked bare as a vulture's din-din. The pilot's seat is, appropriately enough, an aluminium aircraft seat. Tracey's Engineering at Echuca made up a super-strong roll bar, which, combined with the full-seat harness, provides the driver with plenty peace of mind. Instruments include a tacho (redlined at 6000 — although the mill has run up to 7 grand on occasions), oil pressure and temp gauges. An EH master cylinder with its pendant pedal has been bolted to the. bulkhead and activates the rear brakes. After taking the pics you see here, we were taken for a blast up and down a piece of private bitumen nearby. . . . Once the mill fired and warmed up a bit, the jigger really got with it and fair flew. With a quarter-mile behind us, the temp needle sailed right across the dial into the hot, hot, hot zone — but things cooled down quickly and we were away again on the "return" run. Even the slightest prod of the pedal was enough to shoot the tacho needle past the redline. While under power the rig tracked straight and true; stopping proved no problem, either, with the Holden drums on the rear being quite up to the task of hauling the beast to a halt from around 100 mph with no drama. The car uses all three forward gears to cover the quarter at the moment, but the team are going to experiment with smaller rear tyres and see if they can't get respectable timeslips using second gear away from the line and top for the remainder. For an investment of $300, Bob and Allan have got themselves a real goer in C/A class, and here's wishing them the best of future success at Calder. 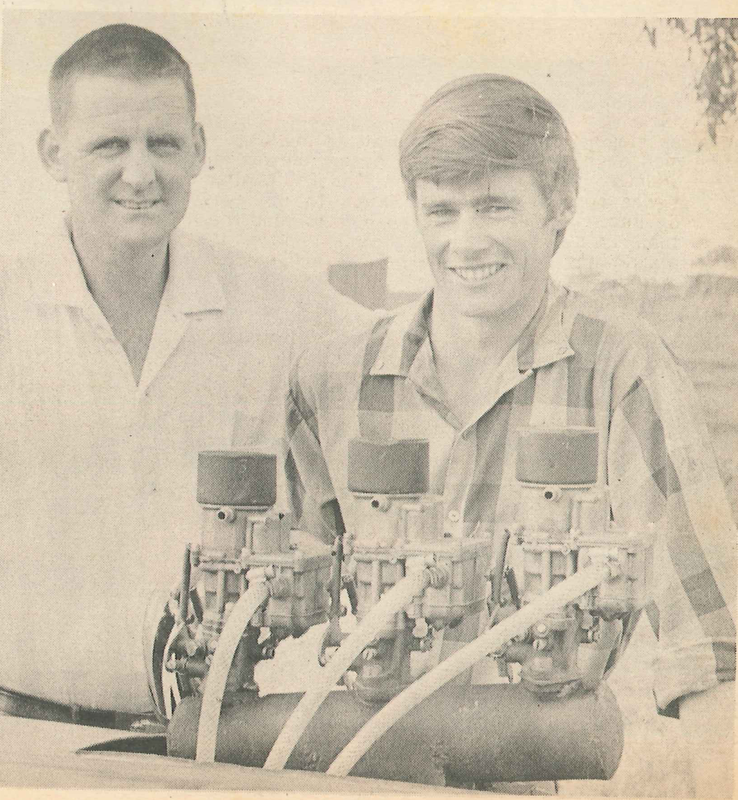 HAPPY team of Bob Buchanan (left) and Allan Gamble like their drag racing to be loads of fun and their "Crater Critter" fills the bill perfectly. Incredible grey motor ,what was horsepower range? went down to low 12 seconds ! could beat some v8s in those times.. any more pictures of engine ? Unfortunately I have been unable to obtain any more info as of yet, the current owner does have a dynamo sheet, I'll harass him again.